The DAV (Disabled American Veterans) and Hankook Tire hosted a Mobile Service Office stop at Gateway Tire & Service Center in Clarksville, TN this week. 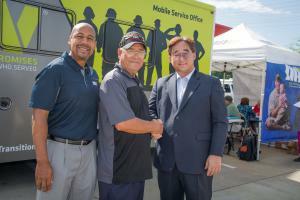 CLARKSVILLE, TN, USA, September 16, 2018 /EINPresswire.com/ -- The DAV (Disabled American Veterans) and Hankook Tire hosted a Mobile Service Office stop at Gateway Tire & Service Center in Clarksville, TN this week to assist veterans and educate them and their families on the benefits and services earned in service. This program extends DAV’s benefits assistance to veterans who might not be able to access it otherwise due to distance, transportation, health or other various reasons. Hankook continues its promise to help American veterans through mobility by doubling the number of Hankook-sponsored DAV MSO stops year-over-year with 12 MSO stops across the nation this year.